What vegetable is actually a fungus? Why mushrooms, of course! While there are thousands of mushroom varieties in all kinds of colors, shapes and textures, only a fraction make it into the kitchen. Mushrooms are often classified as cultivated (grown under controlled conditions) or wild (foraged in forests). Some wild mushrooms, such as shiitake and oyster, are now cultivated. 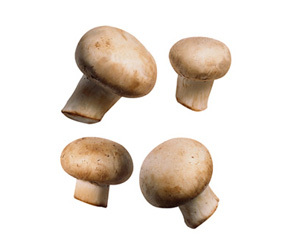 Select fresh mushrooms that are firm, heavy and evenly colored with caps that are free of blemishes. Avoid any that are slimy or have soft dark spots. Mushrooms with closed caps, such as button and cremini, are freshest when the caps are closed. Open caps with exposed gills indicate a shorter shelf life. The exposed gills of open-cap mushrooms, such as portobello and shiitake, should be unbroken. When sealed in plastic, mushrooms quickly become slimy and moldy. Remove them from the carton and refrigerate, unwashed, in a paper bag. The paper absorbs excess moisture and allows the mushrooms to breathe. Or, wrap the mushrooms in paper towels and refrigerate in a plastic bag. Refrigerate enoki and oyster mushrooms for 2 to 3 days and other varieties for up to 5 days. Just before using fresh mushrooms, remove surface dirt with a damp paper towel or rinse briefly under cold running water and pat dry. Never soak mushrooms as they will absorb water and become soggy. Cut mushrooms through their stems into slices or chop. Small button mushrooms are often cooked whole in soups and stews. To keep button mushrooms from discoloring, toss them with lemon juice or rub them with a paper towel dipped in lemon juice and water. Cook mushrooms before adding them to a soup, sauce or other finished dish for the best flavor and texture. Low in calories and naturally sodium, fat and cholesterol free. Substitute smoky grilled or broiled portobello mushrooms for the meat in your favorite burger or steak sandwiches. Serve topped with KRAFT 2% Milk Singles and A.1. Steak Sauce. Extend more expensive shiitake and cremini mushrooms by mixing them with button mushrooms for a "wild" blend. Add the woodsy flavor of fresh mushrooms to your favorite rice pilaf or risotto. Stir cooked mushrooms into STOVE TOP Stuffing for an instant burst of earthy, autumn flavor. Keep mushrooms on hand to toss into stir-fries, pasta dishes and cooked vegetables. Thread small whole mushrooms onto skewers and grill or broil for a tasty appetizer or side dish. Brush with your favorite KRAFT Dressing or A.1. Steak Sauce.